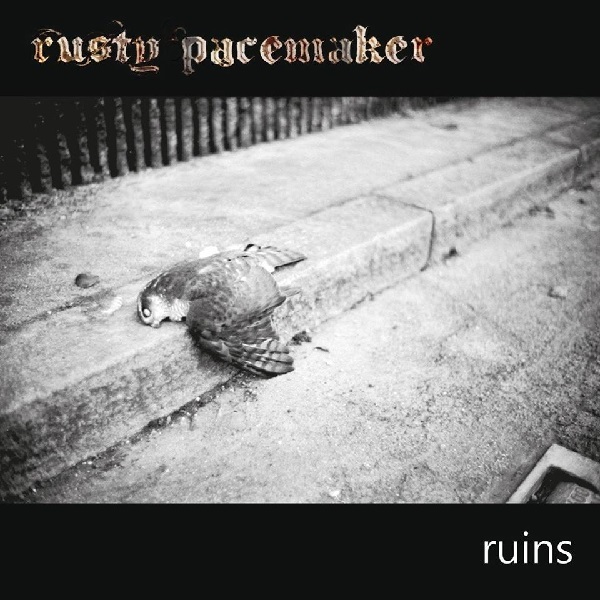 Rusty Pacemaker is a long standing project by Lanzenkirchen, Austria native Rusty Hessel. The operation began back in 2003 when Rusty started writing and recording rough demo material. Eventually he teamed with drummer Franz Löchinger to record the full-length debut, Blackness and White Light. The album was recorded at White Studio, and released through Solanum Records (both of which Rusty owns) in late October of 2010. Since then, much of the time had been spent revamping and rebuilding the studio, as, according to the official biography on the band website, “he found the working condition in the White Studio quite frustrating,” as well as composing material for the follow-up release. Titled Ruins, the creation was recorded between 2012 and 2014 before finally seeing the light of day in May of 2015. But is this actually a well composed sample of melodic doom metal and rock influence, or is it not really worthy of the high praise it has received as of late? For the most part, Ruins does stick fairly close to the solo act’s previous outing, with one obvious difference: The audio quality. This one is a dramatically more crisp effort, leaving far behind the analog quality of the last release, which kind of sounded like someone plugged a microphone into the appropriate jack of a computer and recorded that way. The guitars sound a lot bulkier in comparison, not to mention sharper when no distortion is used or treading into acoustic territory, the bass is a subtle hum, and the drums all sound pristine with no washout present from over-compression. While it presents a far more refined offering, it does pull some of the faults in the vocals right to the forefront, unlike the last venture where it was hidden by the rawer presentation. The clean vocals do have a tendency to often go off-key with the music, there is layering that seems as though it’s not properly done, and there are times where auto-tuning seems to be present, though I cannot say for certain if that’s the case, the aforementioned layering, or a mixture of both creating that effect. While Ruins sounds crisp, digital, and wholly new, the performances don’t really stray from the mixture of My Dying Bride and early Anathama doom metal that composed Blackness and White Light, especially on the tracks that push well past the seven minute mark. “Ruins” taps into the latter quite well, though still retaining a hint of transitional Katatonia that emits the necessary rock overtones just past the fairly melancholic introduction. The slower pace everywhere but approaching five minutes in does still make this an overall grim track, but the whistling at the end may catch you off guard at first. It sounds cheesy in that initial experience, though, after a while, you do see it makes sense given the delusions and rationalizing mentioned in the main verses that depict a slower plummet into madness as the world in which the person depicted in the lyrics slowly crumble into what the title depicts. “Candlemess” has a strong drum presence, especially with the steady bass kicks at the start. There’s also a hint of pagan grandeur in the slower, mournful guitars throughout the performance that nicely manage to tug on your heart strings, as well as make you wish much of this release shared a similar presence. “Pillow of Silence” kind of falls in line with this as well, though some of the chords are better fit to a depressive black metal composition with how cold they sound. It’s a respectable track with a heavy gloom lingering over the largely sad and nature-fuelled environment that comes off far more intimate than one might expect. The only real gripe is the shouting of “no” around four minutes in, coming through as if Rusty were reading it off a script during a day time televised soap opera instead of bellowing it out for an emotional impact. Sadly, this does pull you out of the song a bit, but the acoustic shoegaze just past five-and-a-half minutes in is a nice touch that does make up for it a bit, lulling you into a sense of security that slowly grows more tense as you come to the realization that the safety blanket, or loved one that represented it, wasn’t really there, leaving you standing all alone in the cold the riffs from earlier established. Meanwhile there are songs like “Made of Lies” that come off a cross between Sentenced and Lacrimas Profundere. The clean singing here works well against the harsher, though incredibly infectious music that could even be compared to “Keep on Rotting” by Carcass just past the half way point. There’s also “Matter Over Mind”, which doesn’t quite have that signature Sentenced melodic death/gothic rock sound as obvious as the previous cut, but it still hits pretty close. Again, a little more edge to the vocals at times, such as the push to a higher pitch at a minute and forty-five seconds in would be such a welcome addition. Oddly enough it’s during the far more morose passage around two minutes in that there’s more emphasis in the vocals compared to other segments, which only ends up highlighting how they can go off key with the music sometimes, as well as a forced deeper tone just past three minutes in. Other than that, the faster music ends up a lot richer, often masking such imperfections to where you won’t really pick up on them thanks to the tighter, even more upbeat guitars, not to mention quicker drums. “Knowing”, however, starts out as an odd little folk inspired tune that sounds more like something you would hear around the fire at camp when you’re a child, or as you might expect to hear from The Kingston Trio or Arlo Guthrie when on a more serious note. But, by about a minute, the distortion kicks in and we’re greeted with a generally dark, yet sleek gothic tinged doom approach with additional range in the vocals, incorporated a hushed tone compared to the standard one throughout the release. There’s also some additional whispers that appear periodically through the album, but don’t always fit as snugly into place as they do here. You also happen on some additional shoegaze by the two minute mark, though it’s used more as a bridge to drive back into an upbeat take on the folk performance from earlier. While the album sounds good, has a number of well done performances, not to mention some surprisingly deep lyrics from time to time, Ruins greatly suffers in the vocal department. It actually takes a little while to start accepting the pretty straightforward approach that takes its time to enunciate each word in damn near every song. At first it sounds amateurish, but the more you listen, the more it does make sense to the overall picture being painted. This is thanks largely to the many noticeable off-key moments that the music simply doesn’t have the noise to bury within the mix, an unfortunate trade-off that does hold this effort back quite a bit. Had the music been a little dirtier and not as pristine and digital as it is, the additional bulk it would provide to the guitars and bass would have aided all aspects of the release, even those that really go without need of improvement. But if you can look past that, which time does become a little forgiving and helpful in that, there is still a good album waiting for you to discover. Digital review copy of this release provided by Solanum Records.